"Covering All of America Coast to Coast"
Find out how to get in on the annual multi-billion dollar outdoor billboard industry! Thank you for visiting Billboard Brokers of America, we are a turnkey national billboard sales and development company. Contact us in the form above for any questions you may have about investing in the outdoor advertising industry. Whether you are trying to supplement your present income, retirement or personal wealth portfolio you need to check out the financial returns on owning outdoor billboards. To help you get started I want to send you "Free" material I have written to give you a better understanding how many billboard entrepreneurs increase their personal wealth in this multi-billion dollar cash flow industry. Let me qualify myself I have been serving the outdoor advertising industry since 1963. I started out working for a small Florida outdoor advertising company in the early 60's,my first job with them they dropped me off on a new billboard site to dig 6 holes for 6 telephone, six feet; deep with a pair of post hole diggers. In those days billboard people dug hole by hand, I had dug hole before but none like these, they were lime rock and gumbo clay. I had no idea what the first job I would be doing, I was not prepared for that, I had no gloves and no water. It was a hot July day I am in a field with no trees or shade around and no transportation in the middle of nowhere. By mid afternoon I had the holes dug, I am sunburned with some of the largest blisters I ever had on my hands, needless to say I may be tough but I am not stupid. Lesson learned. I could have walked off that first day but I am not a quitter I was there to learn everything I could about the outdoor advertising business. And that I did, by the end of the 3rd year I was running two billboard construction crews, on highway paint crew and a shop paint crew, for those of you that don't know in those days all billboards were hand painted. Once I knew how you made and painted billboards I was out of there. I opened my first outdoor billboard business, in few months it took off like crazy,before I knew it many of the accounts in the area started coming over to me. Not because I was a kid, not because I knew everyone, but because I was honest and I turned out a quality product backed with quality service. Most of men that worked for the other billboard company came over and applied for jobs I hired a few of them including the former owner of the other billboard business, after I left he had sold out his interest to his partner. What about the guy who dropped me off the first day I worked beside the road with no gloves, no water and no transportation? You know the one who was supposed to stay and help me dig the holes? The one that left me without gloves and water? Well believe it are not I hired him, he lost his job with the other billboard company and he applied for one with me, yep I hired him just so I could fire him. Don't let anyone tell you vengeance is not sweet (lol). I built and sold my first business for seven figures after three years, that was a lot of money in the 60's, can you imagine what it would have been equal to today? Occasionally drive by my old billboards and locations every once in awhile, many of them are still up, they have been flowing cash for the past 48 years plus. The point is if a kid can start off with less one hundred dollars and end up with seven figures in his pocket almost 50 years ago, what can you do today? Today it does not take much to turn a few billboards into a million dollars, I had a client that turned down 1.3 million dollars for one billboard. Myself I have went on to build several companies since the 60's, some for myself and many more for others, many of the name you would recognize, some are Fortune 400 who own fortune 500 companies. I have had the privilege of working with some of the finest and best people through the outdoor advertising industry both national and Internal. Internationally for over half a century. I have seen both good guy and bad guys come and go in this business, one thing remains the same this is a great industry to be in if you like to make money! Over the pasted 50 years I have seen what works and what doesn't work in this industry, this is not rocket science most anyone with commonsense and little ambition can make money in it. Whether you are a small investor or large investor the formula is the same. Let me show you how the magic is done. Ask my company for a bid on your next Project. We have professionals to assist you with your billboard real estate acquisitions, permit expediters, attorneys, engineers, fabricators, installers and the latest in your digital needs including management, technicians, and artist. Serving the United States and Canada. Novice Billboard Owners and Investor contact us ask for our publication "The 8 Most Asked Questions by New Billboard Buyers" if you are an investor looking for a new cash flow stream and a higher return on investment, contact me now I would like to show you an Alternative Investment with a higher return and less risk on your investment capital. We have a consulting service and we are here to direct you every step of the way. We can show you everything you need to know about billboard investing and how it can work for you. I will answer all of your questions about What is outdoor advertising and how I can I make it work for You? Including How to get started and where to find the best billboards locations and finally I will show you How to build and a billboard cash machine. We have over 2,700 commercial properties across America listed in our data bank waiting to be researched and developed into a prime billboard and digital billboard locations. 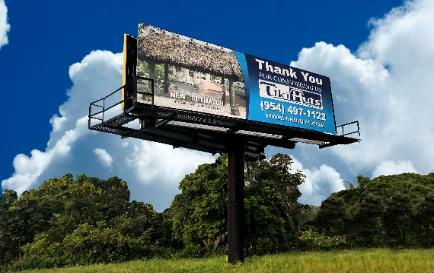 If you are a company looking to expand your billboard inventory, contact us we can help. We buy, sell and develop outdoor billboards and digital outdoor signs for our clients. If you become a registered buyer you are already financially per-qualified to buy new billboards and billboard properties from our listings the same day they are posted. Registered buyers are referred to as Preferred Clients. Preferred Clients are only a text, e-mail or phone call away from instantly locking down a new sale. All sales are sold on a first come basis. As us how you can become a Preferred Client get the red carpet service and be one of the first new billboard sales as they come in. Ask me for an application to become a Preferred Client. Maximize your property's income, email me and let's get started. If you are a property owner with property next to a busy freeway or in the city you may want to consider leasing a small location on your property. Did you know a mono-pole billboard actually only takes up on an average a 4 foot X 5 foot area at ground level? Everything else is airspace high up out of harms way. If you have a property you would like to lease please do not hesitate to ask for my free publication on How to Maximize Your Real Estate's Income.